The cyclist was hit by the lorry on Good Friday. GARDAÍ HAVE RENEWED an appeal for witnesses after a cyclist was seriously injured after being hit by a heavy goods vehicle (HGV) in Crumlin last month. The 39-year-old male cyclist was seriously injured when he was struck by the vehicle at the junction of Grove Road and Harold’s Cross Road at about 3.50pm on Good Friday (14 April). The cyclist was hit as the HGV turned left onto Harold’s Cross Road and he proceeded forward towards Parnell Road. He remains in a serious condition in St James Hospital following the incident. The driver of the HGV was uninjured. Speaking at Crumlin Garda Station, Superintendent Michael Cryan called for witnesses to come forward. “This collision occurred shortly before 4pm on Good Friday and it is clear from CCTV that there were a lot of pedestrians, cyclists and motorists in the vicinity at the time and their assistance is needed in establishing the exact circumstances of this collision,” said Cryan. 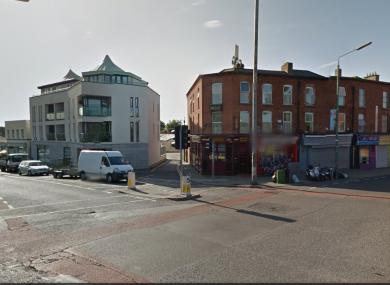 “Gardaí would in particular like to speak with a male pedestrian who is seen on CCTV at this junction at the time of the collision. This male was wearing a black leather jacket with blue jeans. Gardaí would also like to speak with the occupants of a small boxed refrigerated white truck which travelled directly behind the HGV involved prior to the collision. Anyone with information is asked to contact Crumlin Garda Station 01-6666200, Terenure Garda Station 01-666 6400 or the Garda Confidential Line 1800 666 111. Email “Gardaí reissue appeal for witnesses after cyclist seriously injured in collision with lorry”. Feedback on “Gardaí reissue appeal for witnesses after cyclist seriously injured in collision with lorry”.